Take a close look at the Facts & Figures panel to your right. The last line reveals something you’d not normally expect from a Mercedes: “My test car cost €77,434 BUT after a 10pc ‘promotional’ deal it comes to €69,961.” Even for a Merc buyer, that’s a lot of money. Why is the marque effectively cutting prices by 10pc? It doesn’t happen too often does it? The simple, if slightly simplistic, reason is the ‘trickle effect’ of used UK imports. There have been so many of them, and I am certain there will be far more, that dealers here (all dealers, not just Mercedes) are finding the going tougher than they would like. It’s largely because people are bringing in fairly-fresh cars from abroad. The greater supply is lowering prices – naturally. And all of a sudden your car – regardless of brand – isn’t worth as much to trade in against a actual new one . Your dealer can’t give you what he/she could, even six months ago, and has to factor in the fact that it may be harder to shift at the higher price. The end result is it costs more to change to a new car. The upshot, in Mercedes’ case, is it took the decision that a 10pc cut in its new-car prices, for a short time anyway, would even the playing field somewhat and narrow the Cost-to-Change gap. Result? My test car drops €7,000-plus. I don’t know how all this will pan out so I’ll concentrate on the car and the drive while we wait to see how the future unfolds. It’s going to be an interesting year. All I know is that I drove this car – sometimes it ‘drove’ me – with a great degree of ease and enjoyment. Yes, it had the self-driving/autonomous-drive system but as I’ve found before, there are drawbacks. It doesn’t do everything – that’s vital for you to know – and is prone to flap a bit when it loses sight of road markings, especially at off-ramps on motorways. You also have to put both hands on the steering wheel at regular intervals or it will start beeping non-stop and eventually grind to a halt. Other than that I’m getting used to just sitting there, keeping a watchful eye, of course, but not doing a lot apart from noticing things like materials, displays, how comfortable the seating is, looking for bits and pieces to criticise. Yet, rather than this being about self-driving cars (again), I’d prefer to deal with what you get with, and from, this premium estate. I know such estates are not big sellers but they do have a loyal following. Not everyone wants an SUV just yet. Up to now, I would have said the BMW 5-series Touring was the most ‘desirable’ mid-size lifestyle estate. I loved it. Still do. But Volvo has an exceptional V90 (and a tradition of making great estates). The E-Class, traditionally, would have been viewed as being some way off the pace: shaking the ‘German taxi’ slur has taken longer than you’d think. This new E-Class has changed my perceptions. Certainly the saloon is one of the best cars around right now on a pound-for-pound basis. The improvement in its cabin, chassis and technology (especially) is mirrored in the estate where, for example, the widescreen cockpit interface not only works so, so easily but gives focus to a classy interior. 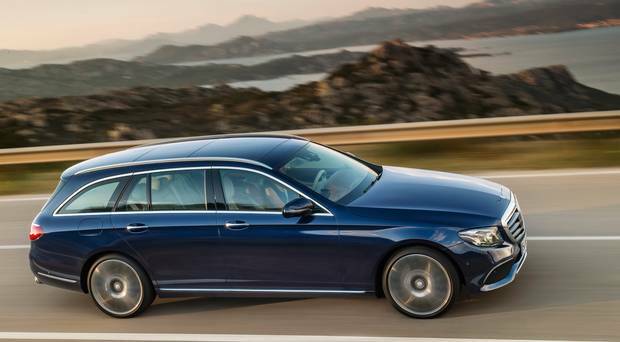 It has to be the best cabin in this mid-size estate class. The Volvo is tight on its tail but the E-Class conveys a greater sense of luxury and a bit more dynamism. Another reason I liked it was the presence of the new (multi billion euro) 2-litre diesel engine. It is so much better than the 2.1-litre currently in so many others, which I have criticised heavily from time to time. This new one was quiet and powerful, with loads of torque (pulling power). More revealing, perhaps, was the level of handling and ride. For a car whose predecessors badly trailed the 5-series, this has drawn much closer. It’s lively, reasonably sharp but perhaps not quite the dynamic force of the Beemer. Merc buyers aren’t necessarily looking for that. Nice to have now, though. For me, the estate’s forte was the sweeping motorway drive. It swished me (it ‘drove’ most of the way) to Enniscorthy and back, for example, and it was almost like having a chauffeur. In contrast, it did pretty well on the twisty narrower roads too where I put it through its paces: no ‘self-drive’ there I can tell you. Would I buy it? Yes. But I’d be careful because it gets pricey quickly if you add in a few extras. Just because the price dropped doesn’t mean you are that much better off. Don’t forget: you may still be paying as much to change as before. Your car and the new Merc may just have ‘kept their distance’ on price. Just like it does with the car in front on the road when it’s ‘self driving’. Mercedes E-Class 220d auto estate with AMG Exterior Pack: 1,950cc, 194bhp, 4.2/4.6 l/100km, 120g/km, €200 road tax. Standard spec includes a swathe of safety/driver-assist systems. On this model there was also electric 4-way lumbar support, LED lighting, self-parking Park Pilot, heated front seats, leather, etc. The options included Technology Pack, 12.3ins widescreen cockpit, AMG exterior Sports Pack, 20ins alloys, panoramic electric sunroof, driving assist package includes ‘autonomous’ drive facility and wireless charging system for mobiles. My test car cost €77,434. But after 10pc ‘promotional’ deal, it came to €69,961.